As the Emperor plays counterpoint to the Empress, the Hierophant plays counterpoint to the High Priestess. Hers is hidden knowledge; his is open. 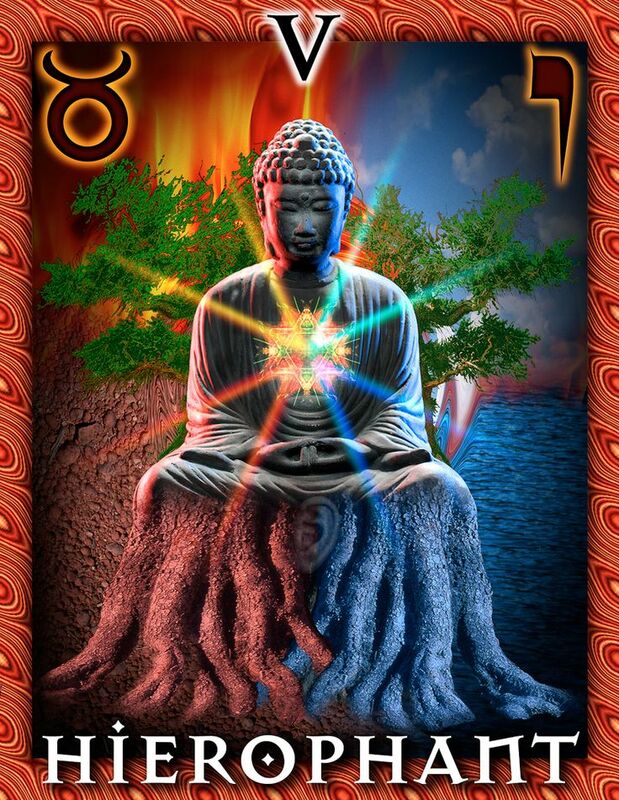 The Hierophant represents fire, and masculine spirituality–the sol aspect of the soul. The High Priestess represents the feminine, or luna, aspect of the soul. In the Marseilles Tarot, this card is the Pope. The pope is the leader of exoteric religion, which creates order and laws of morality for the masses. 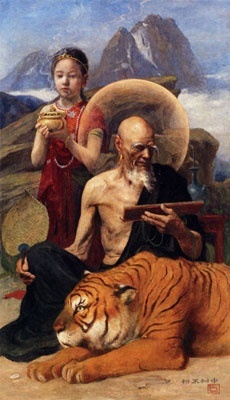 The name of this card was changed to the Hierophant by Arthur Edward Waite for the Rider-Waite deck. The name comes from the Greek term hierophantes, which is a priest who conducts initiation into the mysteries. 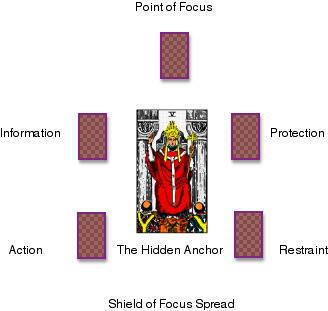 In the Tarot, the Hierophant explains the mysteries of the cards. His book is open; the secrets are there to be read by all. 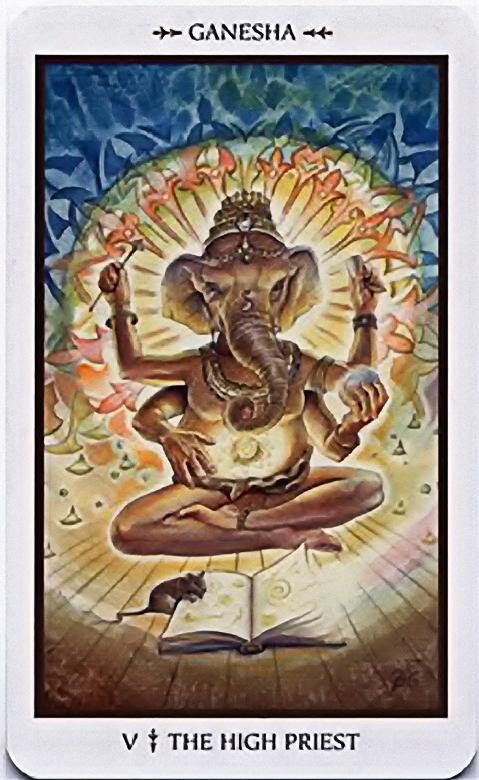 The Hierophant is crowned by a magnificent triple crown, which appears often seen in alchemical texts and represents dominion over the three kingdoms: animal, vegetable and mineral, which have been nurtured by the Empress. The triple crown especially applies to Hermes Trismegistus, whose name means “thrice crowned or “thrice great”–literally, “as great as can be.” The Catholic pope also wears a triple crown, which symbolizes the three estates of God, or the Trinity. The small figures at the sides of the Hierophant represent the Emperor and Empress, who are being joined in sacred marriage. They are the earthly representatives of the celestial masculine and feminine principles. Mediating between them is a candle flame, representing the Hierophant’s element, fire. Fire is reiterated in the throne of the Hierophant, an upward pointing triangle, which is the alchemical symbol for fire. 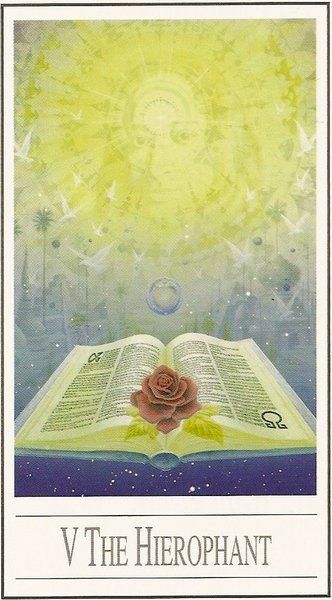 The Hierophant’s book shows fixed and volatile changing into each other, which we will find repeated in the Wheel of Fortune card, further along in the Work. 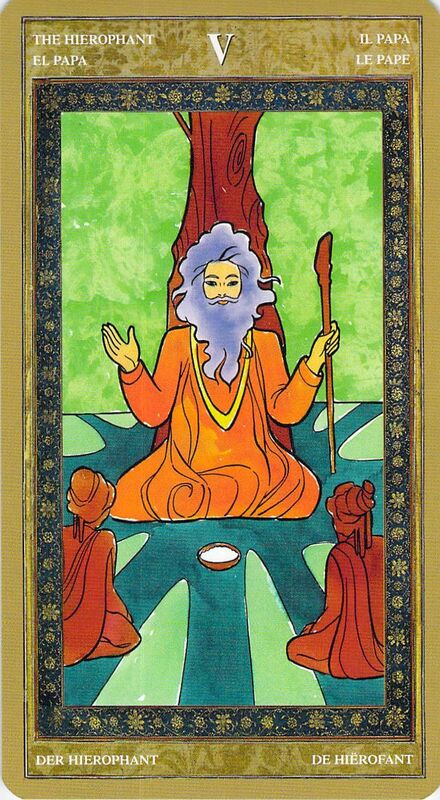 The triple aspect of the Hierophant is reinforced by the three moons and three suns. The brightest sun is the gold of the Work–the Philosopher’s Stone, the enlightenment. The Hierophant’s number, five, adds the fifth element: the quintessence, or quinta essentia, also known as ether. The term comes from the Latin word quintus, which means “the fifth.” Unlike the four elements, which are constantly variable, the quinta essentia remains unchanging. It holds the other four elements together, and is the nurturing Anima Mundi. Pythagoras said the fifth element is what the stars are made of. It is a spiritual constant, and adds spiritual quality to the physical world. In magic, we find the quinta essentia expressed in the pentagram. 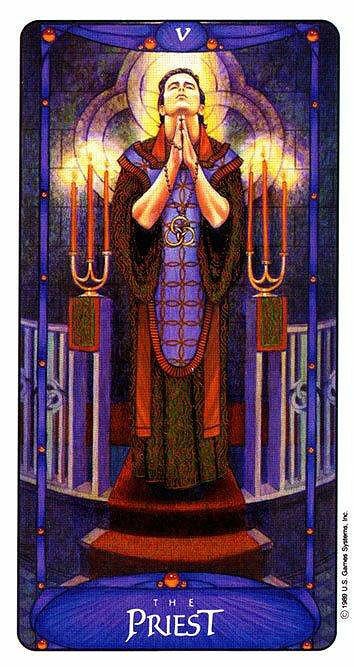 Tarot wisdom: The Hierophant tells us we have obtained wisdom in our quest of the Work. We are grasping the marriage of the principles of heaven and earth, spirit and matter, masculine and feminine–a union necessary for the synthesis of the philosopher’s stone. We are in touch with both those energies, and are capable of keeping them in balance. However, we have much yet to learn, for we are not quite a quarter of the way toward our final goal, the World. The Hierophant’s book is open, but it is long and deep. 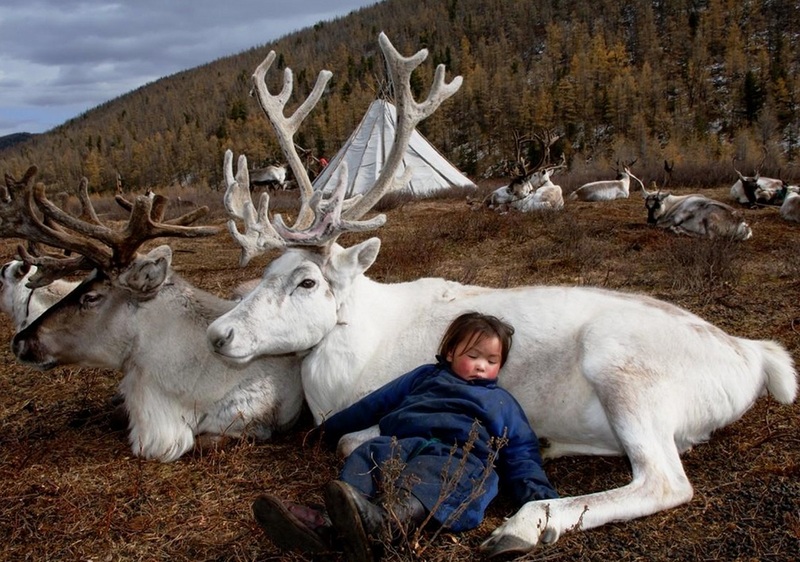 We cannot rest on our laurels. 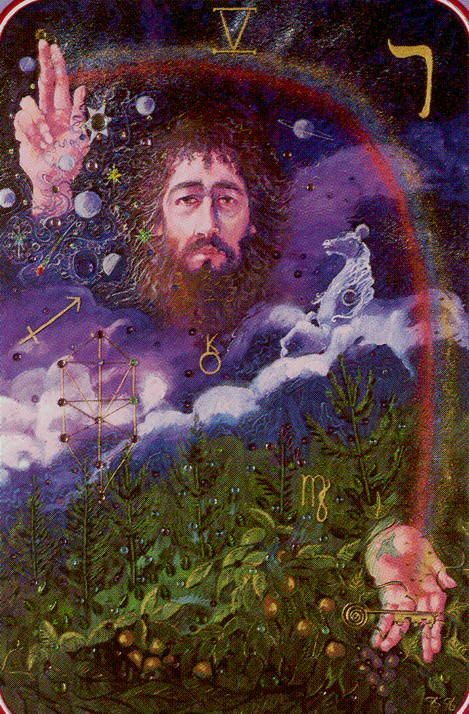 We must integrate the knowledge we’ve acquired, and continue our quest, for we stand at the threshold of the next major phase of the alchemical process. 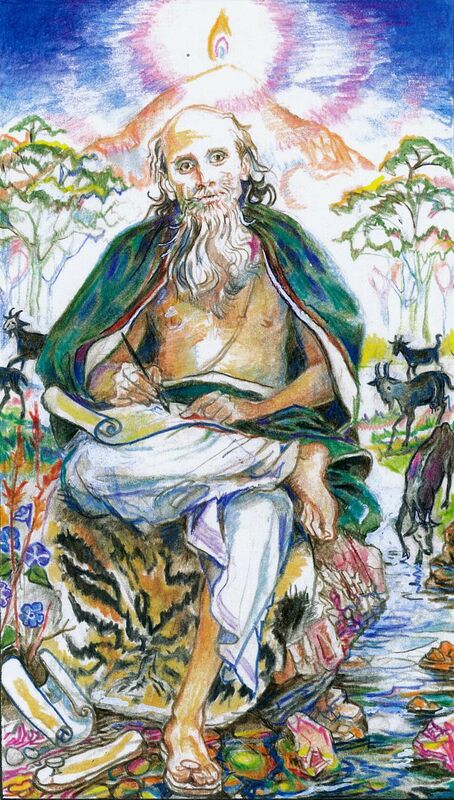 The Hierophant marks the end of the solutio, the dissolution of the prima materia into its four elements. HEBREW LETTER: Vav, nail or hook. Used to refer to the hooks by which the veil of the Holy Tabernacle was hung. Literally, the conjunction “and” in Hebrew, signifying connection or union. Third letter of YHVH, with correspondent meanings. CARD NAME: Hierophant, Greek for “Revealer of the Mysteries,” or “one who shows holy things.” Older titles of this card included The Pope (which is just Pop or Papa, a virtually universal linguistic artifact in just about every language). ESOTERIC MEANING: The Eternal (or Triumphant) Consciousness. It is the pleasure of that Glory beyond which is No-Glory like unto it. It is also called the Garden of Pleasure, which is prepared for the Compassionate (i.e., the Adepts). TANTRIC & ALCHEMICAL SIGNIFICANCE: The Stone: Sanctified Union of the Priest and Priestess. DIVINATION: Wisdom, intuition, manifestation, teaching (inner teachings received), philosophical, goodness of heart, harmony, marriage, help from superiors, peace, stillness, occult force voluntarily invoked.